The President of the Constitutional Court (CC), Park Han-chul announced that the Court must make a ruling on President Park Geun-hye’s impeachment before Mar 13.1 CC President Park’s term ends on Jan 31. He will relinquish his authority to Justice Lee Jungmi, whose term expires on Mar 13. If the Court affirms the impeachment vote, the presidential election should occur within 60 days and the newly elected president will assume his/her duty without a transition period. – Late April/May: presidential election. 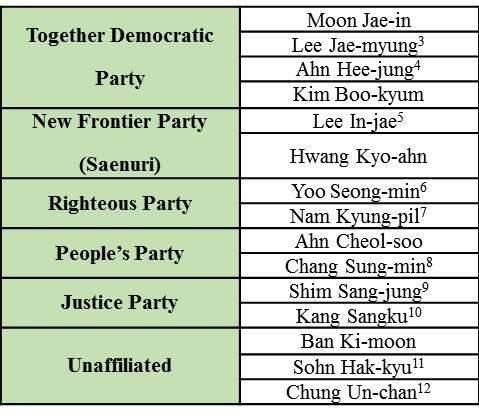 On Jan 26, Seoul Mayor Park Won-soon (TDP) withdrew his candidacy for the Blue House.13 His absence narrows down the TDP field to Moon Jae-in, Lee Jae-myung, Ahn Hee-jung, and Kim Boo-kyum. Among them, Moon is widely considered to be the favorite. Both Yoo Seong-min and Nam Kyung-pil announced their candidacy on Jan 25. Yoo stressed the importance of Korea’s economic recovery.17 Nam emphasized his youth, stating that the upcoming election is “no longer a battle between conservatives and progressives but one between the old and the new.”18 How the former UN Secretary General Ban Ki-moon aligns himself in this election will impact who will ultimately represent the Righteous Party. moon, Sohn Hak-kyu, and Chung Un-chan. Ban Ki-moon is expected to make an announcement regarding his political affiliation after the Lunar New Year holiday. Ban may join the Righteous Party or run as an independent. One certainty is that he considers himself a conservative.19 Sohn Hak-kyu, (former governor of Gyeonggi Province) and Chung Un-chan (former prime minister under President Lee Myung-bak) are also searching for a party platform. THAAD continues to be a major issue of contention in South Korea. As the government is moving to finalize the arrangement,27 there are a number of factors that could delay the process. One is the declining public support. According to the Nov 2016 poll conducted by the Asan Institute, 46.3% of South Koreans approve of THAAD while 45.7% disapprove. This is a significant drop from 73.9% in February. Another factor is timing. 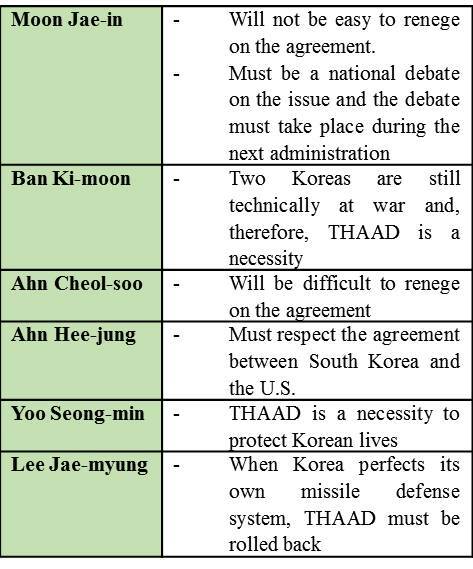 There is intense debate among presidential candidates regarding the THAAD. Candidates Moon Jae-in and Ahn Cheol-soo admitted that reneging the agreement on THAAD will be difficult. Moon has urged the current government to pass the decision on to the next administration, however. Ban Ki-moon and Yoo Seong-min voiced their support for THAAD. Lee Jae-myung has been most vocally opposed. “‘목요일 선고-수요일 선거’ 관행 따르면 4월 26일 대선유력,” 동아일보, 2017년 1월 26일. “이재명 대선 출마선언 … ‘박근혜 이재용 사면 결코 없을 것’,” 중앙일보, 2017년 1월 23일. “안희정 ‘젊은 대통령과 함께 세상을 바꾸자’ 대선 출마 선언,” 경향신문, 2017년 1월 22일. “이인제 4번째 대선출마 선언 ‘집권 6개월내 개헌’,” 동아일보, 2017년 1월 16일. “유승민 ‘정의로운 민주공화국 만들겠다’,” 경향신문, 2017년 1월 25일. “남경필, 대선출마 선언 … ‘기본소득보다 기본근로 보장, 일자리 대통령 될 것’,” 조선일보, 2017년 1월 25일. “장성민 전 의원 대선 출마선언 … ‘국민의당에서 경선할 것’,” 중앙일보, 2017년 1월 17일. “심상정 대선출마 선언 ‘노동복지국가 만들겠다,” 한겨레, 2017년 1월 19일. “정의당 강상구, 대선 출마선언 … 심상정과 경선 예고,” 경향신문, 2017년 1월 24일. “손학규 대선 출마선언 ‘모든 개혁세력 모아 신체제 건설 앞장 서겠다’,” 중앙일보, 2017년 1월 22일. “‘모든 준비 끝냈다’ 정운찬도 출마선언,” 한겨레, 2017년 1월 19일. “‘박원순 대선불출마 선언, 네티즌 ‘남은 임기 서울시 잘 이끌어주세요’,” 조선일보, 2017년 1월 26일. See Asan Korea Perspective Vol 2. No. 2. “‘지금은 아니다’ … 黃대행, 대선출마에 묘한 여운,” 조선일보, 2017년 1월 24일. 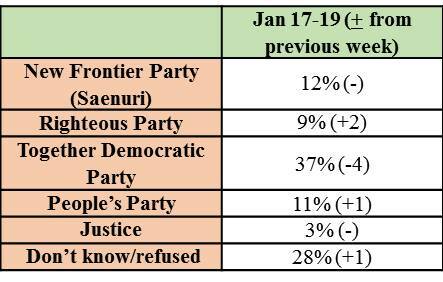 Gallup Korea, date: Jan 17-19; sample size: 1,012; margin of error: +3.1 at the 95% confidence level. “유승민 ‘대선 후보 가운데 제가 유일한 경제전문가’,” 중앙일보, 2017년 1월 25일. “‘이번 대선 올드&뉴의 싸움’ 세대교체론 깃발든 남경필,” 중앙일보, 2017년 1월 16일. “반기문 ‘난 역시 보수’ … 汎여권에 먼저 둥지 틀 듯,” 조선일보, 2017년 1월 24일. “삼성 거쳐 대통령 겨누려다 제동… 법조계 ‘특검, 애초에 무리수,” 조선일보, 2017년 1월 19일; “삼성 앞에 멈춘 법원, 더 힘내야 할 특검,” 한겨레, 2017년 1월 19일. “특검 ‘삼성 특혜 의혹’ 혐의 보강에 전력,” 서울신문, 2017년 1월 25일; “특검의 삼성 외 재벌 수사, 궤도 수정이냐 전략 고수냐,” 한국일보, 2017년 1월 20일. “‘블랙리스트’ 수사도 朴대통령 정조준,” 조선일보, 2017년 1월 18일. “‘블랙리스트 의혹’ 김기춘ㆍ조윤선 구속영장 청구,” 한국일보, 2017년 1월 18일. “세월호 한 달 뒤 블랙리스트 작성, 박 대통령이 지시,” 중앙일보, 2017년 1월 22일..
“‘죽을죄 지었다’던 최순실 ‘민주 특검 아니다’ 고성,” 한겨레, 2017년 1월 25일. “특검, 박 대통령 쪽에 ‘2월초 대면조사 받으라’,” 한겨레, 2017년 1월 24일. “황교안 ‘사드 가급적 빨리배치해야’,” 중앙일보, 2017년 1월 23일. Kim Jiyoon, John J. Lee, and Chungku Kang, “A Shrimp Between Two Whales? Koreans’ View of the US-China Rivalry and THAAD,” Asan Issue Brief, Jan. 2017. “대선 다가오자 문재인-안철수 ‘안보 우클릭’ … 사드반대 입장 바꿔,” 동아일보, 2017년 1월 17일. “중국이 보복할까봐 … 사드부지 제공 망설이는 롯데,” 중앙일보, 2017년 1월 17일. “당국자 ‘中 사드 보복에 WTO제소 등 국제법적 대응 검토’,” 경향신문, 2017년 1월 25일. “‘권력 앞에 굴복, 정의는 어디에’…대선주자 ‘재벌개혁’ 목청,” 경향신문, 2017년 1월 19일. “재벌개혁 전략 논쟁…‘최대한’이냐 ‘최소한’이냐,” 한겨레, 2017년 1월 23일. “‘헤지펀드 먹잇감 될 판’… 재계 ‘상법 개정안’ 공포증,” 조선비즈 2017년 1월 23일.